When a school is expanding or building a new school in the US and needs a clock, they turn to Americlock. Windsor Prep academy in St. Petersburg Florida outside of Tampa did just that. Opening the new school, they felt it was important to make the school standout a bit more and help keep their students get to class on time. With this decision they felt that if they had two clocks over each entrance to the school they could achieve the look they wanted for each school clock as well as keeping their students on time. The school chose to use silhouette markers fabricated and installed by Americlock. 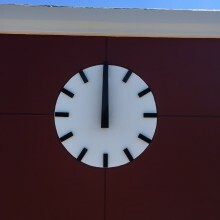 These clock numbers were placed on their existing stucco wall which they used as the background. Not only was this cost effective, the color of the stucco background provided a good contrast for the clock numbers to be seen from a distance. These clocks measured 47″ in diameter and were fabricated from 3/16″ thick aluminum with studs in order to mount them to the stucco wall. The clock hands are aluminum and reinforced to be able to withstand against extreme winds and other elements. Using our paint system we can ensure this gloss black paint will be able to withstand the salt air as well as UV without fading or discoloring. The clock motors for this school clock were placed into UL listed NEMA enclosures so that they could be placed on the parapet wall behind the clock faces. These clocks will keep accurate time as well as adjust automatically for daylight savings and power outages without the need for any upkeep or maintenance. 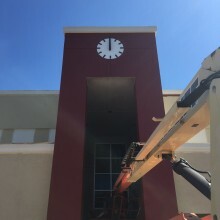 Americlock provided installation on the school clock to give the client peace of mind, ensuring that the job would be completed professionally, on time, and on budget. With a warranty to back up our quality standards and the site installation, the school can rest at ease knowing that their students will always know what time it is in order to get to class on time.